In all kinds of asphalt production, asphalt has to be heated, conveyed and made to meet various technological requirements. 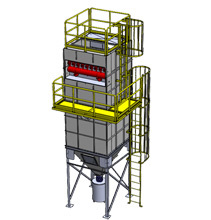 In this process, a large amount of asphalt gas is produced. The gas contains many kinds of organic matter, which is harmful to human health by the means of adhesion on the flyash below 8 um, sucked through respiratory tract in the body. So it is very necessary to purify the asphalt gas and satisfy the standards in atmospheric environmental.